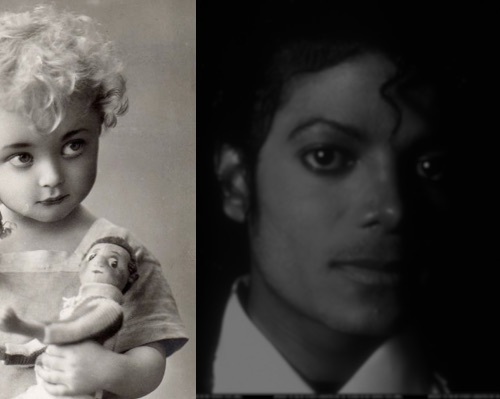 It was about 1984, something like that and I was well into the Jackson Five, madly in love with Michael Jackson. My bedroom walls were testament to that, with pictures of Michael everywhere. One of my favorite pictures was a full facial of Michael with his apple hat on and I loved it. I used to sleep in the top bunk there and my younger sister Louise was in the bottom bunk. My sister Clare, who had not long given birth to my niece Becky, was in a single bed opposite the bunk beds and to the side of her was the wall with all the Jackson pictures on. Our bedroom had veranda doors on to one of the small balconies. I don’t think the curtains were closed because I distinctly remember moonlight coming in, it wasn’t romantic in any way, it just gave light. I woke up in the middle of the night and I was looking down at my elder sister Clare’s bed and she had a crib on the floor beside her. At the end of her bed was a little girl in a white lace gown and I can only describe her a three or four year old, little ‘Shirley Temple’ with this mop of curly blond hair. I was starring at her and I wasn’t frightened of her, because she was so gorgeous. I could only see her side on because she was looking down at my sister. I immediately knew it was someone in spirit form, because I could see my favorite poster of Michael Jackson, right through her body. It’s funny, because you pass the same places everyday and maybe don’t notice things – on my way to school I’d come out of the tenement block and walk straight on to Orphan Street. I never connected the two things – the street name and the little girl – until much later. I spoke to aunties and friends of my mums who lived on Myrtle Gardens and we discovered that Myrtle Gardens was actually built on a orphanage. Perhaps a lot of the orphans would have passed in that area. My sister Louise says that there was a grave yard on the same site and we can only assume that the graveyard would have been for the orphans. They wouldn’t have had anyone to pay for their burials in Victorian times. So it would be quite feasible that there were a lot of spirits on those grounds.